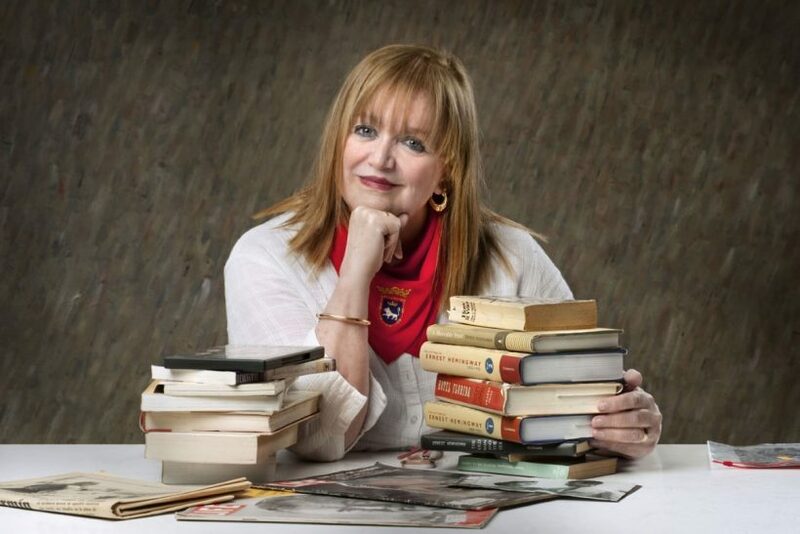 American journalist, Lucinda Poole, will be awarded during Sanfermin 2017 with the XIV Premio Guiri del Año, an award which is given each year by Kukuxumusu and Sanfermin.com to a foreigner who has stood out for their love of the Sanfermin fiestas. This year, in its fourteenth edition, the winner of this award is the versatile journalist and translator, Lucinda Poole, who will follow in the footsteps of last year’s winner, Englishman Tim Pinks. Lucinda Poole is a 60 year-year-old woman, from Chapel Hill (North Carolina) and she has been associated with the Pamplona fiestas for more than three decades now. Indeed, her first writing on the fiestas was a guide book published as “Don’t Be a Foreigner in Sanfermines”(1982). Some 10.000 copies of this guide have been sold to date. She is also a habitual collaborator in the International Press office of Navarra, where she helps many visiting journalists to get an understanding of what the fiestas are all about and what lies behind them. This latest “Guiri de Sanfermin winner,” has a very clear idea about what makes the Sanfermin such a unique and popular worldwide fiesta: “This fiesta is unique in the World. It is pure joy. A community of people from all over the world who arrive in Pamplona prepared to spend the best times of their lives. It might take a month to recuperate, but it continues to change the pathways of many young fiesta goers”. She has managed to accumulate the staggering figure of 30 annual visits to Sanfermin and she has published a countless number of articles about the Sanfermin fiestas. Her first contact with Spain came about when she started to study Spanish Language and Literature at the University of North Carolina before going on to complete her studies with a two-year stint at the University of Salamanca, with further studies in Spanish Literature. She returned to the USA to take a degree in Journalism and International Relations. She also took some further studies and training in the area of motivation and self-esteem. She has also worked as a legal translator and interpreter. She is married to musician, Bill Lyerly, and she acknowledges that her life took on a new turn the first time she came to Pamplona for Sanfermin fiestas. “I grew up in a “Gone with the Wind “ atmosphere where women never danced in the street. My first visit to Pamplona was as a student during Sanfermines. Before I could finish lacing my alpargatas, I suddenly found myself with a crowd of new friends who dragged me down Carlos lll where everyone was dancing in the streets, singing songs I didn´t know and drinking so much of a strange mixture of wine and coca cola that finally all I could think about was fiesta, fiesta and more fiesta. I felt a freedom that I had never known in my very protected life, and I loved it. Even when I discovered that Pamplona was a little different during the rest of the year, I was determined to live here. Hemingway didn´t bring me here, it was just that I had fallen in love, and who can explain that? ”, she remembers. Her professional career as a journalist has always been closely linked to the Sanfermin fiestas. She has worked with different media outlets such as the Diario de Navarra newspaper and Time magazine and over these last years she has been working as an advisor to foreign journalists at the Navarra International Press Office. “We help them in every way possible, always stressing the positive side. A girl taking off her t-shirt in the Chupinazo isn´t Sanfermines. Unfortunately many journalists see a front page photograph in that, and there is so much more to our fiesta. While respecting the freedom of the press, we would like to discourage this type of reporting. It may be the product of ignorance because the majority of reporters who come -not those from here- haven´t got the slightest idea where to go or what to do. We, at the OIP, also strongly support the freedom of women to be safe during Sanfermines. I would like to see more of a sense of community and family”. With regard to the Running of the Bulls, while she has never taken part in the event, she realizes that it is a central part of the whole fiesta scene and must be protected: “My heart stops when the bulls start running. It is so beautiful, but, at the same time, so dangerous, but too many runners think of it as a sport or have no idea of what to do. I cannot stand it when someone holds onto the horn of the bull of runs with his hand on top of the bull. I have seen what can happen and have interviewed many families who lost sons or other relatives in the encierro. And in previous years, I have written on the web page of the OIP about the exact nature of gorings. It is not pretty.”.